Humility Among the Animals. Short audio story narrated in American English. There was once a kangaroo who became an athletics champion. However, with this success he became arrogant and nasty, and he spent a lot of time making fun of others. His favourite target was a little penguin whose walk was so slow and clumsy that it often prevented him from even finishing the race. One day the fox, who organised the races, let everyone know that his favourite for the next race was the poor penguin. 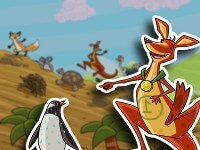 Everyone thought it was a joke, but still the big-headed kangaroo got very angry, and he ridiculed the penguin even more than usual. The penguin did not even want to take part in the race, but it was a tradition that everyone must do so. On the day of the race, he approached the starting line in a group which was following the fox. The fox led them up the mountain, while everyone made fun of the penguin, commenting on whether he would roll down the mountain or just slide down on his fat belly. But when they reached the top they all shut up. The top of the mountain turned out to be a crater that had filled with water, making it into a lake. At this point, the fox gave the starting signal, saying: "First to the other side wins". The penguin, excited, waddled clumsily to the water's edge. Once he was in the water, though, his speed was unbeatable, and he won the race by a long distance. Meanwhile, the kangaroo barely managed to reach the other side; tearful, humiliated, and half drowned. And although it seemed like the penguin was waiting to make fun of the kangaroo, the penguin had learned a lot from his suffering, and instead of ridiculing the kangaroo, he offered to teach him how to swim. For the rest of the day the animals enjoyed themselves, playing in the lake. But the one who enjoyed himself the most was the fox, who, with his cleverness, had managed to bring the kangaroo down a peg or two.